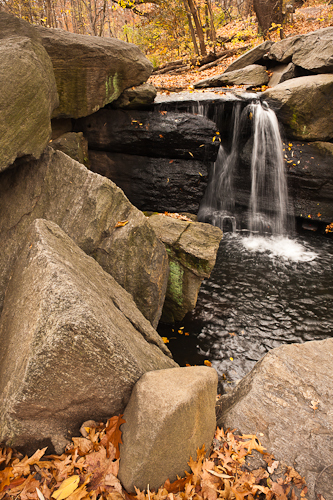 It isn't too difficult to capture a traditional nature photograph in Manhattan. When I need a little dose of nature, I head to the northern section of Central Park. There are quite a few forested areas, with giant native trees- These areas are mostly fenced and signs are posted letting park visitors know that these are natural areas. While walking along "The Ravine" which eventually leads to this waterfall, I saw a Cooper's hawk, tufted titmice and chickadees, and a flock of about 20 white-throated sparrows. Not bad for an island where most people live in tiny brick, concrete, and steel boxes stacked on top of each other. Gee, it almost looks really "real." Central Park, of course, is wholly an Olmstead "artifact." Scott- Yes- It's amazing what 150 years of growth of trees, moss, and just leaving certain parts of the park pretty much alone- can do. Only about 50 feet downstream from this waterfall though, the stream sinks into a giant grated pit, going underneath a swimming pool. It would be fun to find some old historical photographs and do some then/now type shots...maybe that will be my goal for the next trip. glad you could find a spot of nature within the city. such finds are priceless when we miss our own natural surroundings. Naquility- Yes- they are absolutely priceless- a quick visit to the park can help me recharge after battling the millions of other people in NYC.